More and more people become aware of our deep connection to The Universe. Even science provides us with explanations of this connectedness through quantum theory. And if you’re one of those souls who love observing the phases of the moon, you have the natural instinct to know the moon’s effects on us. The moon has the power to affect our moods, spirits, and even our bodies. The truth is, the moon is not the only heavenly body that has a direct effect on us. Everything in The Cosmos is entangled and interconnected, everything has some kind of an effect on everything else. 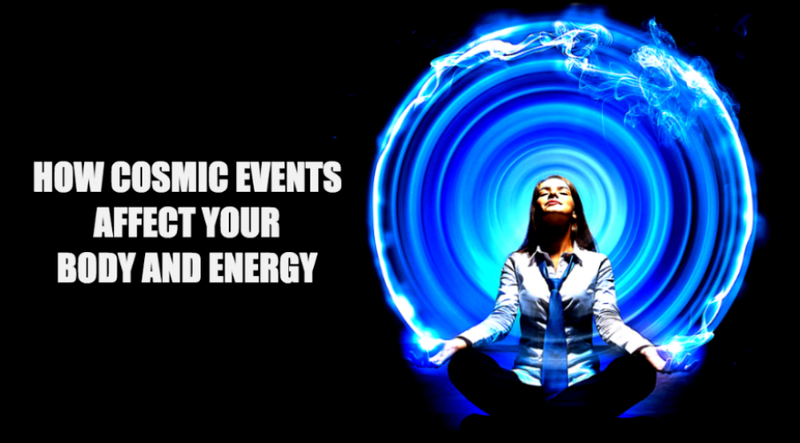 Cosmic events can affect the way we think and feel. But they also have an effect on our physical bodies and energy. 1. Cosmic changes that make our energies low. We are prone to having low energies when many planets are in retrograde, meaning there’s a significant transit or shift that’s taking place. During this period, we’re required to look back to our past to be able to move forward. If we’re not aware, these low energy frequency can create blockages that make us feel stuck, stagnant, lethargic, sluggish or unmotivated and lack of focus. On the physical level, we may encounter digestive issues, bloating, irritability, stuffy nose, constipation, muscular aches, and back pains. As a result, we crave for extra time to sleep. 2. Cosmic changes that make our energies high. The start of a new cycle, such as the New or Full Moon, evokes higher energy. This also happens when a planet moves into a new sign and in cases of a solar or lunar eclipse. This high energy period heightens our intuition and psychic abilities and activates our third eye. Because they provide us with a feeling of release, these high frequency energies also amplify suppressed aches, pains, wounds, as well as good feelings. It’s also the period where we feel more energized and inspired. On the physical level, we become more sensitive. Catching coughs, colds, and viruses are a common occurrence during this time. Aside from that, high energy frequencies can make our body prone to blood pressure problems, loss of balance, feelings of dizziness, skin conditions, and skin problems like pimple or acne. We also tend to feel insomniac, get worried more, and be restless. 3. Cosmic changes that direct our energy inward. We are required to direct our energy inwards during retrograde, Autumn Equinox, and Winter Solstice. Directing our energy inward is needed to end an old cycle and to prepare us to move onto the next chapter in our life. The moments before and after a significant change or shift, are the moments of adjustment and reflection. As we direct our energies inward, we can clear our physical symptoms and can activate the healing and releasing processes of our body. 4. Cosmic changes that direct our energy outward. Our energies are directed outward during Spring Equinox and Summer Solstice, meaning after having begun a new cycle or a new shift of energy. This outward energy frequency helps to inspire and energize us into action. On the physical level, the healing process of the body is stimulated and the symptoms are felt on the external level. We have to take note that physical symptoms appear only when there are blockages or underlying issues that need our attention. You need to be more conscious of the pattern between these events and the symptoms to find clues to your body’s healing. Getting a headache during Full Moon may suggest a blocked intuition that needs release and healing. Or, feelings of lethargy during periods of low energy may indicate that you need to focus on your self care. During an eclipse, people may experience the same effect, but don’t expect to feel exactly the same because you have your own personal astrology. Look at your symptoms on a personal and energetic level. The cause of your symptoms may vary from that of others. Whenever you feel something, ask yourself whether there are things that you’re still holding on to. An imbalance always manifest itself through physical symptoms. Every time you feel these symptoms during cosmic shifts, ask what The Cosmos is telling you. Rituals like meditation, exercise, and others are the best tools you can use in managing your energies during these periods.